“Until the (no-confidence motion) is declared by the court to have been unlawfully passed, it remains valid and binding and time is running,” Ramkarran, a former two-term Speaker of the National Assembly and now political party executive, wrote in his Conversation Tree column in the Sunday Stabroek today. “Not yet having acted in compliance with Article 106(6) by resigning, the Cabinet including the President are unlawfully holding on to office. A court would be approbating this illegality if it allows even a temporary respite from compliance with Article 106(6), especially having regard to the fact that it is not the end of the life of the Government,” he said. The former Speaker in noting that Article 106(6) provides no time within which the resignation should take place, argued that it should “be done with all convenient speed,” as provided by section 28 of the Interpretation and General Clauses Act. Having not done so, the President and Cabinet are unlawfully holding on to office, he contended. However, he said that under Article 106(7), the Government, which includes the Cabinet and President, remain in office until new elections. “This obviously means that the resignation is stayed until the next elected President is sworn in,” Ramkarran wrote. In addressing statements reportedly made by Minister of Public Security Khemraj Ramjattan that there will not be a resignation of the President or government as the country cannot be left without any government at all, Ramkarran said that Article 106(7) specifically provides that there shall not be a “governance vacuum” and, in fact, emphasises that the Government will only resign after a President is elected by the election to be held. Ramkarran, one of the leaders of the new political party, A New and United Guyana, also raised the issue of “Caretaker Conventions” which apply when a government is facing elections. According to him, the “Caretaker Conventions” apply during the period from the dissolution of the Parliament to the election of the new government. “It exists because there is no parliamentary oversight. In summary, the conventions are that no major policy decisions are taken to commit an incoming government or limit its freedom to act, no major contracts or agreements are entered into and the use of government resources in a manner to advantage a particular party is avoided,” he wrote. He said that the passage of the Natural Resources Fund legislation and Ramjattan’s remarks signify quite clearly that the Cabinet including the President have no intention of resigning and of observing any caretaker conventions. 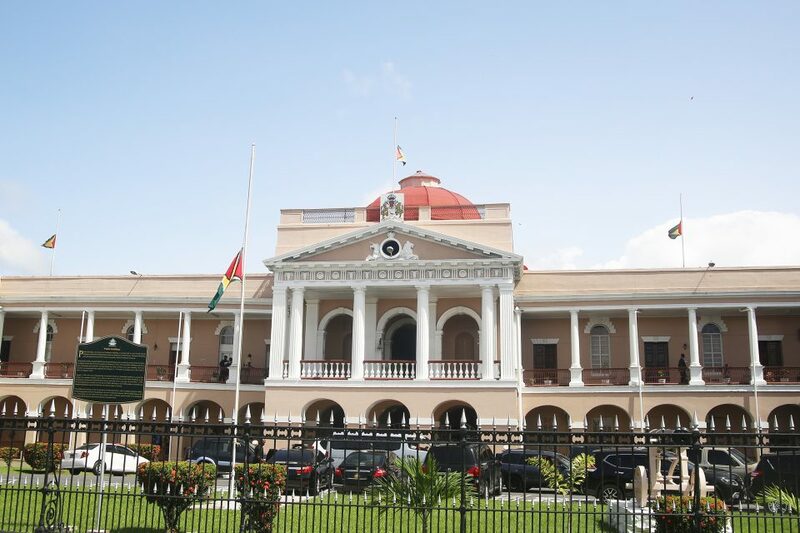 Ramkarran also observed that a court case has been filed by Compton Herbert Reid against Speaker of the National Assembly Dr Barton Scotland, the former government MP Charrandass Persaud who defected to vote in favour of the no-confidence motion, and the Attorney General, seeking to set aside the no-confidence vote of December 21. The motion was filed on Friday. Ramkarran noted that the ground is that Persaud’s vote was invalid because he holds a Canadian passport. An order to stay the no-confidence resolution is also being sought but there has been no mention that the motion required 34 votes to be passed, he observed. It clearly suggests that an act of the National Assembly is lawful even if a person who is not entitled to be present and to participate in the proceedings does so, Ramkarran contended. “Consideration would no doubt also be given to the right or power of a court to interrupt a constitutional process, set in train by a parliamentary motion, on which a vote was taken and deemed to have been carried,” Ramkarran said. “If the power exists, should it be exercised, ad interim, upon an allegation that is prima facie answerable by article 165(2) and in circumstances where the notional applicant, the Cabinet, is committing a continuing wrong by not resigning,” he questioned. “The question will no doubt be: How can a court allow a Cabinet to stay in office when the Constitution, a superior instrument to the court, by which the court is bound, says that it should resign,” he wrote.